bl.uk > Online Gallery Home	> Online exhibitions	> Asia, Pacific and Africa Collections	> Bombay University buildings. Photograph of the Bombay University buildings, taken by an unknown photographer in the 1870s in Bombay (Mumbai), Maharashtra, from an album of 40 prints mostly dating from the 1860s. Bombay, the capital of Maharashtra and one of India's major industrial centres and a busy port, was originally the site of seven islands on the west coast, sparsely populated by Koli fisherfolk. Bombay was by the 14th century controlled by the Gujarat Sultanate who ceded it to the Portuguese in the 16th century. In 1661 it passed to the English as part of the dowry brought to Charles II by the Portuguese princess Catherine of Braganza. By the 19th century Bombay was a prosperous centre for maritime trade and underwent an ambitious phase of building which resulted in a collection of some of the finest Victorian architecture in Asia. Much of Bombay's buildings were designed by architects living and working in Bombay. However, the Bombay University complex comprising two separate buildings, the Library (built 1869-78) and the Convocation Hall (built 1869-74), was designed by Sir George Gilbert Scott from his office in London, in the Decorated French style of the 15th century. The project was funded by the Parsi philanthropist Sir Cowasji Jehangir Readymoney and by Premchand Roychand, the banker and 'Cotton King'. 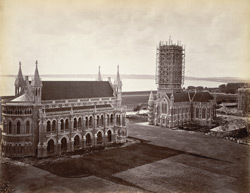 The view from Watson's Hotel looks towards the Convocation Hall at left and the University Library and the Clocktower, (the latter completed in 1878 and here seen shrouded in scaffolding), at right. With part of the Esplanade and Back Bay in the background.